And how do I know if I need a new clockspring? The clock springs are pretty hardy. There's 1 wire for the horn, it just shorts to ground to activate the horn. Could be the horn relay. I changed the horn relay and the horn still does not work. Could it be the ground on the horn behind the bumper? Yeah first check the horn relay, if that checked out OK then do a continuously check between the horn button up to the relay trigger, make sure you get a short circuit with the button pressed. Also check the horn, make sure they work, just jump the relay and see if the horn works. Ok this might be a dumb question. But the two horn buttons on the steering wheel have one wire from both. Are they grounds or does it matter which one I use. And when you jump the relay. Do you just use the pin from the horn relay connector? 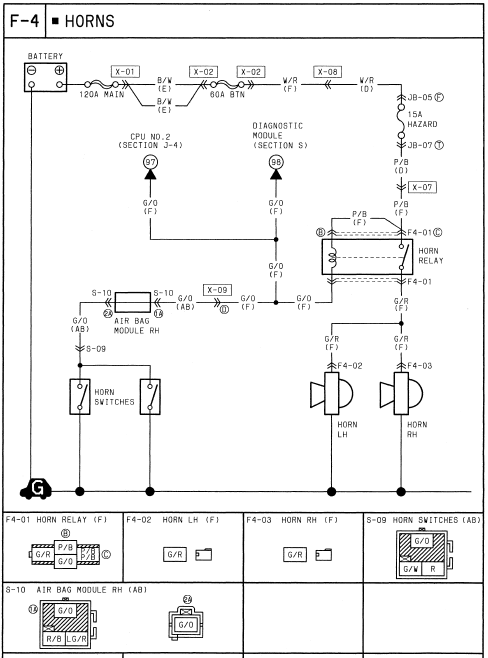 On the picture do I check from horn switch to "A" on diagram? Jump A and C with a wire, your horns should go off, if not then start with your horns. The 2 horn buttons both go to the same wire, so doesn't matter which one you use to do the continuous test. The horn runs all over the front & dash harness. Its also in the diagnostic box for testing purposes. If you've removed your airbag ecu, this will also kill the horns as it passes through.